I like to consider myself such a student, and he has achieved his goal. Hebrews: Ancient Encouragement for Believers Today is neither pedantic nor pedestrian, but vibrant in its simplicity and economy of words. Fudge – a prolific author of at least six books in print and a good quantity of works available free online at http://www.edwardfudge.com/ – expands significantly upon his earlier printed work Our Man in Heaven: An Exposition of the Epistle to the Hebrews (1973), which is similarly uncluttered by complex definitions of Greek or Hebrew terms and by jargon familiar only to professional Biblical scholars. This new Hebrews commentary celebrates a rich gospel full of uniquely Jewish idiom, conveying the awe and wonder of Jesus’ divine ability as a human being to provide the perfect, sacrificial life pleasing to God. So far as the origins of Hebrews, we have just reviewed the traditional questions (by whom? to whom? when? where? why?) and the traditional answers (don’t know, don’t know, don’t know, don’t know, don’t know). Fudge doesn’t complicate Hebrews’ message of encouragement , which he sees structured around four messianic Psalms (8, 95, 40 and 110), with a great wealth of supporting scripture, both Old Testament and New. You’ll find no distracting footnotes below the text; relevant citations are briefly mentioned within it – though there is a comprehensive bibliography at the end. Matters which are tangential – but still important – to the understanding of the text are set apart in blocks with gray backgrounds, occasionally of more than a page each. Don’t expect Fudge to propose and exhaustively defend a large number of theses on any given question; he is more likely to summarize the more valid or helpful possible answers, credit their adherents, and point out the collective value of all of them in helping to illuminate the text. He may point out their strengths and weaknesses as lenses in seeing the text clearly. But frequently he will observe of seemingly competing interpretations: “We lose nothing by holding to both ideas” (p. 148) or “Either explanation yields the same result” (p. 164). He will fire the imagination – like the tableaus presented to John in the Revelation – by setting an obscure text in a magnificent, tangible, understandable scene: a multimedia museum as Chapter 11’s “Hall of the Faithful;” or an Olympic track venue filled with Chapter 12’s “cloud-crowd” of witnesses. In every instance, he will concisely re-tell the story of each forerunner mentioned, illuminating aspects of the story you may never have considered before. Fudge enthusiastically recognizes the one and only main character of the drama, however: Jesus, the Christ, the Son of God. His story, the good news, is the same in this gospel as in any other in scripture: what He alone could provide that pleased the Father – and what it means for us. In fact, the “Introduction to a Book of Unknowns” is worth the price of the entire volume. 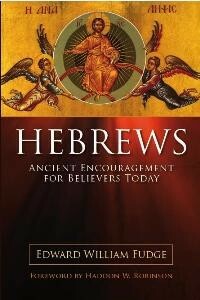 If I could, I would gladly go back in time to provide a copy of Hebrews: Ancient Encouragement for Believers Today to each of the teachers of the adult Bible curriculum at my church, which began a study of Hebrews just a few weeks ago. Sadly, that study will be over before the book is available for shipping on May 19. The book’s flyleaf pages of endorsements from scholars hailing from many compass-points of Christianity provide a better review of the work than I can write. I have only had time to gobble it down, and its smoothness and richness make that possible – but there are nuggets of deep spiritual nutrition on every page. And I can’t wait to go back and munch. Copyright © 2008 The ZOE Group/New Wineskins Magazine. All rights reserved. Edward Fudge presently practices law with the Houston firm of The Lanier Law Firm, P.C. His mother was born Sybil Short; her parents were missionaries in southern Africa from the 1920s, and she was born and reared in what are now Zambia and Zimbabwe. Her parents were Will and Delia Short, and their story and hers are told in brief in Edward’s book, The Sound of His Voice. His father was Bennie Lee Fudge, a Christian publisher and preacher who influenced a generation of believers in Churches of Christ and Christian Churches through his “Use Your Bible” workbooks for Sunday Schools. Edward is an author of Christian works and a frequent guest speaker at many churches and gatherings, and operates the gracEmail ministry as well as maintaining its Web site,(www.EdwardFudge.com). Keith Brenton serves as managing editor for New Wineskins. He describes himself at his blog (Blog In My Own Eye) as a “stumbling follower of Christ, husband, dad, writer, occasional Bible class teacher, currently serving as communications specialist at a large metro church. Someone who questions reality and won’t settle for an evasive answer.” He occasionally posts at (the New Wineskins blog). You can reach him by e-mail at (webservant@wineskins.org).